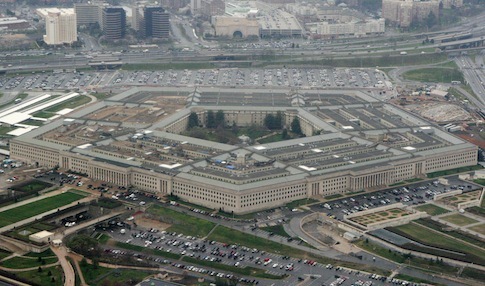 China’s development of precision weapons and other advanced capabilities has undermined U.S. military superiority, the Pentagon’s senior weapons developer told Congress on Wednesday. "We're at risk and the situation is getting worse," Frank Kendall, undersecretary of defense for acquisition, said. Kendall singled out China’s military buildup as a major worry, noting that in 1994 the communist state was assessed by U.S. intelligence agencies to be a backward military power, but one that would be more advanced in 10 or 15 years. He also noted Russia’s increasingly threatening military posture. "The intelligence estimates were correct," he said, of China. "And I became, I think it's fair to say, alarmed as soon as I started seeing technical intelligence reports on China's modernization programs." "And I can say the same with Russia's modernization programs as well," he added. The U.S. military was dominant following the collapse of the Soviet Union in 1991, he said, and the U.S. action in the Persian Gulf war demonstrated the nation's conventional force prowess. But beginning in 2001 the military has focused on counterinsurgency and counterterrorism campaigns against a very different kind of threat. "No one observed more carefully the dominance that we demonstrated in 1991 than the Chinese," Kendall said, referring to U.S. precision arms capabilities, stealth forces, and ability to conduct wide area surveillance. "And what I'm seeing [now] in foreign modernization, again, particularly China's, is a suite of capabilities that are intended, clearly to me, at least, to defeat the American way of doing power projection, [the] American way of warfare when we fight in an expeditionary manner far from the United States," Kendall said. The U.S. military’s use of what Kendall termed "high-value assets" such as satellites for targeting and communications, aircraft carriers, and foreign U.S. air bases are now targeted by the Chinese and others with precision weapons, especially missiles. "So if I we're worried about one aspect of the threat, I would start by talking about missiles.," he said. "Both ballistic and cruise missiles that can attack those high-value assets." China has been aggressively building up its missile forces with as many as six or seven new types of ballistic and cruise missiles of varying ranges, including three new land-based ICBMs and a new submarine-launched ballistic missiles, as well as new intermediate and medium-range missiles. Both the Chinese and Russians understand that large numbers of highly accurate missiles are being developed and deployed for the goal of taking out those U.S. high-value targets, Kendall said. "And once those missiles become highly accurate and can kill the thing that you're trying to actively penetrate, then you have a problem," he said. "That's the change that has occurred. And we've pioneered that change, but it's now been emulated by others. And without saying too much about the Chinese, in particular, and again, though to a lesser extent, the Russians, are going beyond what we have done." Both countries are developing advanced weapons to defeat U.S. defenses of the targets. Kendall said senior Pentagon leaders understand the problem but protecting the assets has been complicated by budget cuts and the cost of maintaining global commitments. "We also have readiness concerns," he said. "We also have the threat of sequestration in front of us. So this is a serious problem for the country." In addition to missile threats, electronic warfare capabilities, anti-satellites weapon and other weapons to be used against U.S. space systems are a problem, Kendall said, all of which "are being developed very consciously to defeat the American way of projecting power and we need to respond to that." Kendall’s remarks came during questioning from House Armed Services Committee Chairman Rep. Mac Thornberry (R., Texas) who asked about his concerns on U.S. military technology superiority. Kendall said during the hearing that fixing the military shortcomings is "very much is like changing an airplane engine, while the engine's in flight." "We still have to defend the country while we look to make improvements," he said. China has been building up its military forces aggressively for the past three decades. However, close U.S. business ties with China have made the U.S. government reluctant to respond to the threat. China’s People’s Liberation Army has developed key high technology weaponry as part of a strategy of forcing the United States to abandon its military presence in Asia. The weapons include large number of ballistic and cruise missiles, including a carrier-killing DF-21D missile, anti-satellite missiles, lasers that can destroy space systems, and cyber warfare capabilities designed to cripple the U.S. military’s ability to operate and support forces overseas. Russia’s military has been building up nuclear forces in response to what Moscow views as potential threats in Europe to its offensive missile capabilities. Moscow is building new generations of strategic missiles as well as a new strategic bomber. Sharp defense cuts under the Obama administration, including a $478 billion cut over 10 years imposed during the first term and an additional $600 billion cut in the coming years, have hampered the modernization of U.S. forces.